Preheat oven to 350°. In a 6-qt. stockpot, cook sausage over medium heat 6-8 minutes or until no longer pink, breaking into crumbles. Remove with a slotted spoon, reserving drippings in pot. Add onions and celery to drippings; cook and stir 6-8 minutes or until tender. Remove from heat; stir in sausage. 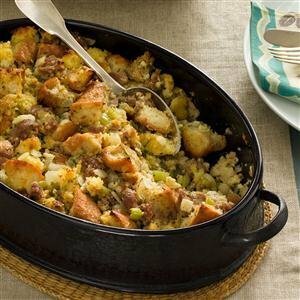 Add cubed bread and corn bread; toss to combine. In a small bowl, whisk eggs, steak sauce, seasonings and baking powder until blended; stir into bread mixture. Stir in enough broth to reach desired moistness. Transfer to a greased 13x9-in. or 3-qt. baking dish. Bake 40-50 minutes or until lightly browned. Makes 12 servings.